I don’t think it will come as any surprise that art is a huge source of inspiration for many writers. 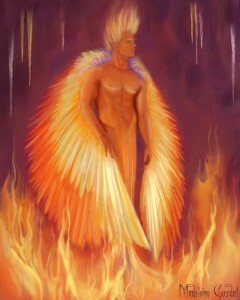 My book, All Fired Up, was solely inspired by a picture I found on Deviant Art called Mixed Ashes by Mahtaliel. If you haven’t been to Deviant Art, you’re really missing out. Some of the artists there are amazing! The picture stayed with me so much that I returned over and over to look at it. Like most writers, the “what if” gene is strong and I started thinking…What if this guy were real? What if the Phoenix wasn’t a bird but a man? What if he had the power to change past mistakes? The questions kept coming and the story began to unfold like a scroll of possibilities. And so, All Fired Up was born. And Mahtaliel gave me permission to post the pic on my website as well so that readers can see what inspired the book. I even sent a copy of the pic to the artist who did my Samhain cover. I think you can see a little of it in there, don’t you? Graphic novels are another kind of art that has inspired me since my high school days. I was a huge fan of Marvel comics and besides my secret boyfriend, Spiderman, there was another series that stuck with me like no other: Cloak and Dagger. Cloak represented the dark while Dagger represented the light. The play of light against dark through nature and humanity is one of those themes that’s always intrigued me. My urban fantasy series, House of Comarré, is based on those ideas. I’m sure you’ll easily recognize Mal as the darkness and Chrysabelle as the light. What’s especially curious to me is what happens when those areas overlap and things become gray. Other sources of inspiration for me are dreams, songs, overheard conversations…really just about anything can inspire a scene, a character or an entire book.